Since I am going on a short vacation there won’t be a “Design Friday” post this week. So I have decided to post something today instead. 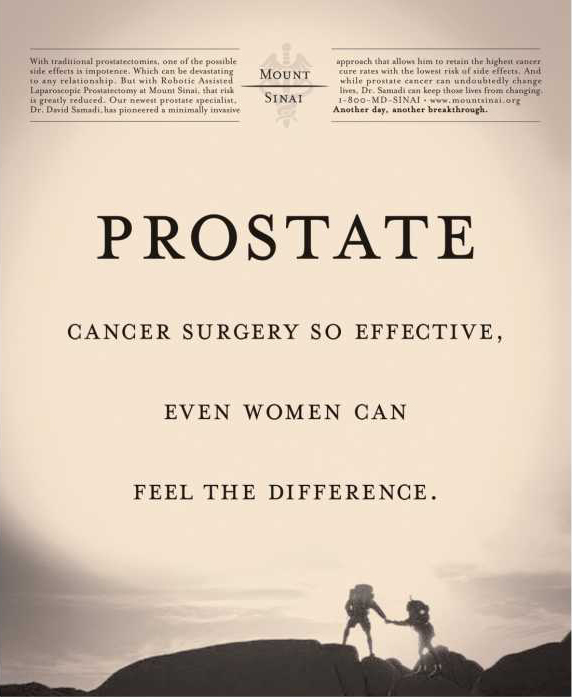 There is a series of ads for Mount Sinai Hospital that have been running in the New York Times, and regional magazines lately. Mount Sinai Hospital, located in New York is one of the oldest, and most prestigious hospitals in United States. This print campaign deals with a variety of serious illnesses and seeks to present Mount Sinai Hospital as the best possible choice for treatment. These are delicate subjects which have been executed with brilliant creative and flawless execution. The copy is simple but powerful, approaching the subject in a way that draws out the readers emotions connecting at a human level. The photography is realistic, sophisticated, and beautiful which helps in targeting the upscale demographic. The balance of the layout is clean but original with the placement of body copy and logo at the top of the page above the headline. The designer has used a classic yet contemporary font (Mrs. Eaves). The pages are duo-toned in warm hues to help soften the overall look. The photography doesn’t show patient faces, which allows the reader to imagine how this could be their own story. In addition there is series of other smaller ads which are more minimal in their approach yet stand out with great imagery and a well balanced sense of humor. Even though the second series of ads builds from a humorous rather than emotional perspective, the overall voice for Mount Sinai Hospital, is maintained across the entire print campaign. 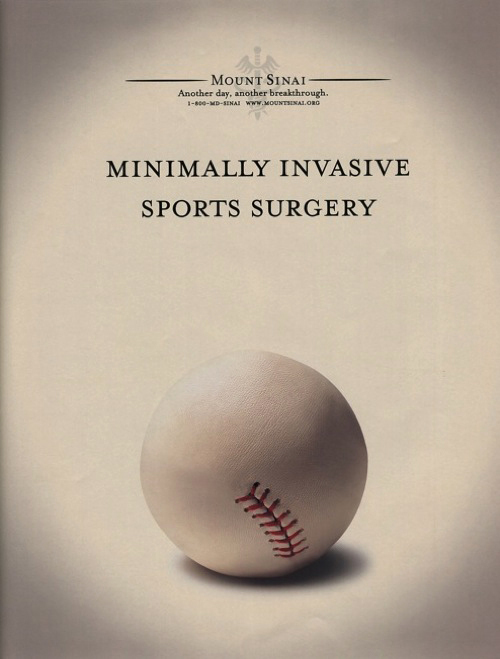 This series of advertisements does a remarkable job well while presenting the Mount Sinai Hospital image with dignity, creativity, and a level of sophistication that the institution deserves. Posted in Advertising and tagged Advertising, Copy Writing, Mount Sinai Hospital, Mrs. Eaves, photography, Print Advertising, Typography on November 24, 2009 by Author. ← The 9ff Porsche 977 Turbo. Sweet Baby Jesus.